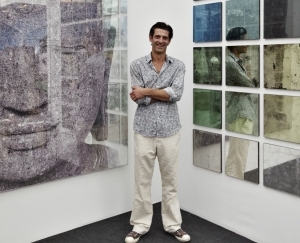 Dominic developed his interest in art, architecture and antiques when living in Paris in the early 1980s. After returning to London to work in the City he soon realised how important his newly-found interests were to him, and decided to turn his passions into a career. Gifted with an eye for detail and artistic talent, he started an apprenticeship with Lucinda Compton which gave him the opportunity to learn and develop restoration skills. In 1990 Dominic set up his own business and developed an extensive knowledge of the industry while building a strong client base. Dominic’s high level of restoration work earned him a valuable reputation and in 1998 he and Lucinda joined forces to establish Compton & Schuster Ltd. The business primarily undertook the restoration and conservation of decorative antique furniture. As a restorer, Dominic had mastered different paint, lacquer and mirror effects. It was only a small step from there to developing his own distinct finishes, one of which was re-creating the ageing process which naturally occurs in old mercury-backed mirror. He soon became aware of the demand for such mirror effects, particularly from designers, and decided to pursue this side of the business. Using either flat or hand-drawn glass, Dominic’s designs are used in both contemporary and traditional interiors, often being used for panelled walls in domestic and commercial projects, incorporated into furniture designs and even used as clock faces. Working with interior designers and private clients Dominic Schuster Ltd undertakes bespoke commissions for domestic and commercial interiors. Recently completed projects include: mirror panelled walls in the dining room at Coworth Park and gilded amethyst statues around the swimming pool; mirrors for Starbucks in Hungary; the Hotel Megaro and the Royal Naval Club (both in London); private projects with leading designers such as Fox Linton Associates, Taylor Howes and Staffan Tollgard. Furniture restoration was the kick-start to Dominic’s creative career, and is still very much in his blood. He continues to restore decorative antique furniture for private clients and antiques dealers, as well as being an advisor to prestigious auction houses such as Bonhams. Dominic and his experienced team work on pieces of great historical interest from some of the country’s most significant houses such as Chatsworth, Harewood House and Weston Park.